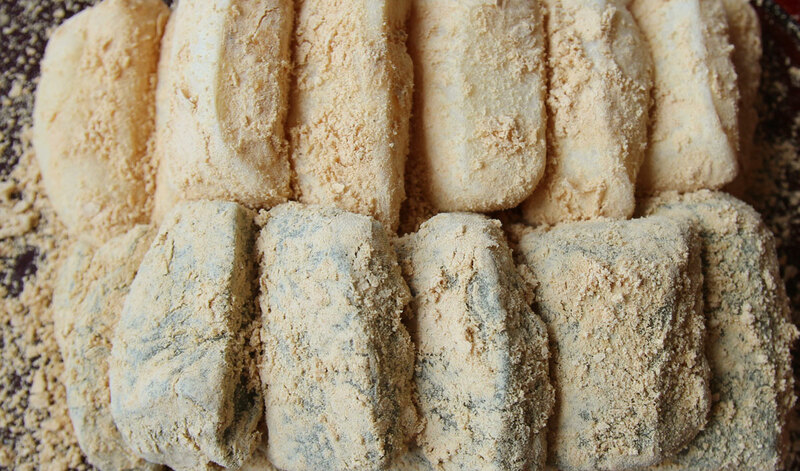 Injeolmi is rice cake made with sweet rice (glutinous rice). It’s one of the most popular and common Korean rice cakes and it’s made on special occasions and Festival days. The rice cake is chewy and sticky, so traditionally it was given to newly wedded couples to wish that they get along and ‘stick together’ forever. The bride’s mother also makes this rice cake for the groom’s family in the hopes that her daughter will get along with the groom’s family. Traditionally it’s made with a mortar and pestle. Soaked sweet rice is steamed and pounded until all the cooked rice grains are mashed. Then it’s coated in roasted soy bean powder or other things like black sesame seed powder, mashed red beans, chopped pine nuts, chestnuts, and jujubes. It’s most commonly made with soybean powder; yes, I mean roasted soybean powder, or konggaru (kong means beans and garu means powder). I remember my grandmother used to make injeolmi at home and usually all adult family members (especially male members) helped. 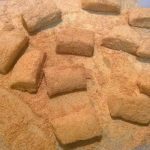 I was always excited to see them making rice cake, and so happy when I ate the freshly made rice cake, coated with lots of delicious soybean powder.These days almost everybody buys or orders injeolmi from a rice cake store rather than making it at home with a mortar and pestle. I’ve often been told by my readers that they cook together with their children. I think cooking together with your mom is fun and a great experience. Children will keep those good memories in their hearts forever. I used to make my own injeolmi without pounding, but the taste always lacked something. It wasn’t chewy enough and I didn’t like the taste at all. 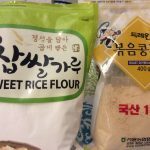 So a few years ago when I lived in Canada, I did an experiment to make this rice cake by pounding, like I saw my grandmothers in Korea do it. It turned out so delicious! I took my injeolmi to work and shared it with my coworkers, and they said it was awesome. Instead of sweet rice, I use sweet rice flour, cook it in a microwave oven, and pound the dough with my small mortar and pestle. It works perfectly! What makes this rice cake perfect is that it’s super chewy just like my grandmother’s homemade injeolmi! *tip: Put a little cold water on your hands when you want to touch the dough so that it won’t stick to your fingers and will keep you from burning yourself. Posted on Monday, August 15th, 2011 at 1:36 pm. Last updated on October 5, 2014. Posted September 15th, 2018 at 2:55 pm | Log in to reply. Hi :) Wondering if I can use mochiko instead of traditional korean 찹쌀가루~ thank you! Posted September 23rd, 2018 at 9:35 am | Log in to reply. Yes, of course! 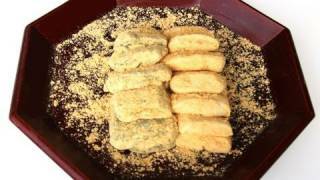 All of my recipes that call for glutinous rice flour (or sweet rice flour) is mochiko. It’s so easy and convenient to get where I live. Posted July 16th, 2018 at 7:08 am | Log in to reply. You make everything look so easy! And I love your portion sizes – they’re just right, especially for this recipe. When I found the same plastic mortar and pestle at a large Galleria Korean supermarket in York Mills (Toronto), I squealed! 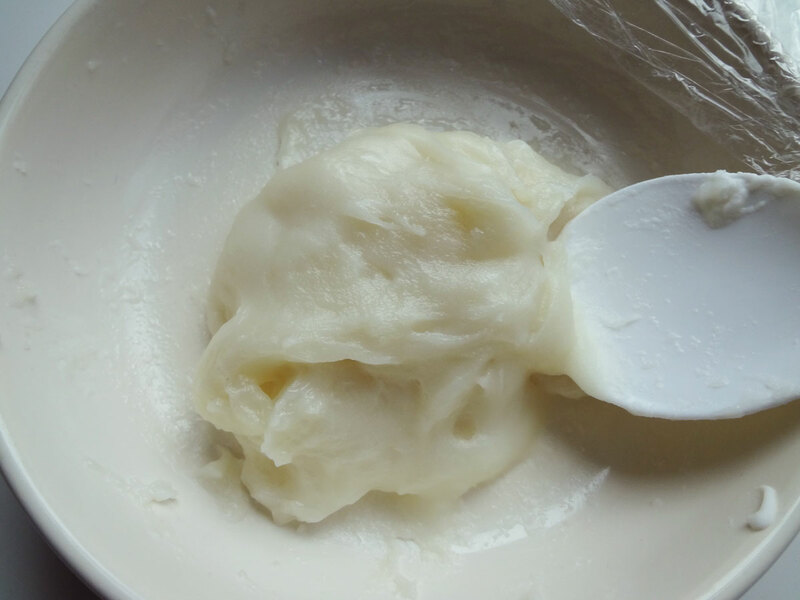 I used 1 cup sweet rice flour and 3/4 cup water but after I mixed it, it was more like a liquid than a dough. Is it because I used a different brand of sweet rice flour? I tried to fix it by adding more rice flour but of course it didn’t turn out right either. please help! 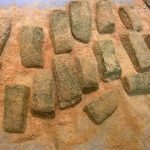 I love injeolmi and look forward to making it with green tea powder too. Posted July 19th, 2018 at 8:29 am | Log in to reply. A couple of days ago I made injeolmi with my own recipe and it turned out well. I’m sure that you need to use same sweet rice flour that I used in the recipe. Posted November 30th, 2018 at 9:17 pm | Log in to reply. success! I mixed the ingredients and it still looked watery, not a dough, but I followed the rest of the steps and was able to make it. It became a dough after microwaving. Yey! So relieved as I still had a bag of rice flour! Posted December 2nd, 2018 at 9:38 am | Log in to reply. Posted February 17th, 2018 at 10:19 pm | Log in to reply. Really want to make this iljeolmi but I couldn’t find Roasted Soybean Powder here in my hometown. Can i change it to other powder? Thank you. Posted August 27th, 2017 at 12:23 pm | Log in to reply. How long can they stay fresh for (before they get hard)? I want to make them and give them to someone, so I want to know if I can make them beforehand. Posted August 31st, 2017 at 9:58 am | Log in to reply. They will be ok for several hours at room temperature. I suggest you give the gift right away, or freeze right after making, and then thaw out just before giving them in a gift box. But freshly made is the best. Posted February 1st, 2017 at 5:29 am | Log in to reply. I made some injeolmis yesterday using yesterday and they came out very good, nutty, chewy and not overly sweet. Since they don’t sell sukgaru here, I made the green ones with matcha powder and the result was great. I gave some to my Korean friend, too, and she sent me a message saying “This is the taste of Korea!”. She really appreciate it. As we all know, when living abroad, being able to get the taste of home is the best! Posted February 1st, 2017 at 5:30 am | Log in to reply. Posted February 2nd, 2017 at 3:52 pm | Log in to reply. Posted February 2nd, 2017 at 3:51 pm | Log in to reply. Posted September 4th, 2016 at 6:14 am | Log in to reply. I couldn’t found sweet rice flour but just finally found sweet rice and like Maangchi home made rice flour, make sweet rice flour and after that because my flour is a little wet just use half cup water and put in my electric steam for 30 minute and put in my mortar and pound kong kong kong ㅋㅋㅋㅋ and it’s soo good but i have use 1Tb spoon sugar like your recipe but injolmi havent sweet. injolme how mach is sweet? because of i made sweet rice flour i should use more sugar? Posted March 13th, 2016 at 3:31 am | Log in to reply. what if there’s no microwave? can i use steaming method? Posted June 12th, 2015 at 4:45 pm | Log in to reply. If I doubled the portions, would the time of cooking the dough in the microwave, take longer? or can I keep it about the same time? Posted March 6th, 2015 at 7:16 am | Log in to reply. Hi Maangchi! I somehow found your website last few days while searching for injeolmi’s recipe and i just made it today. The taste was fantastic! Since I was craving for it since long ago. But I used cocoa powder mixed with icing sugar (to lessen the bitter taste of cocoa powder) for the coating and it was a good choice! Posted March 6th, 2015 at 7:56 am | Log in to reply. Freshly made injeolmi will be ok at room temperature up to 7 to 8 hours. I usually keep the leftover injeolmi in the freezer instead of the refrigerator, then thaw it out when I want to eat it. The rice cake will get soft and chewy. You can also reheat it in the microwave. Posted February 19th, 2015 at 6:31 pm | Log in to reply. i, like more than a few other poor souls, accidentally got 찹쌀가루 instead of 멥쌀가루 and i’m a night owl, so i didn’t realize until i was preparing homemade 떡 for 떡국 for the first time last night. thankfully your recommendation to make 인절미 to someone on your page for making 가래떡 saved me from throwing out over a pound of dough. it was late at night and all shops close early here in Austria, so instead of soy bean and mugwort powder, i dusted the sliced cakes with cinnamon-sugar, cocoa-sugar, and green tea powder-sugar. they taste nice! a friend of mine said 인절미 can also be made like a pancake, i hope to see a recipe for that style 인절미 some day. thank you! Posted February 21st, 2015 at 10:42 am | Log in to reply. You are such a creative cook! 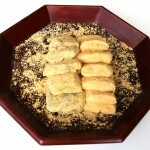 Your injeolmi coated with cocoa and green tea powder sounds delicious! Posted March 6th, 2015 at 8:14 am | Log in to reply. I’ll make sure to check out more of your recipes later! Your page is a great great help! 진심으로 감삽니다! Posted January 15th, 2015 at 12:59 pm | Log in to reply. Posted January 15th, 2015 at 5:13 pm | Log in to reply. Toasted black sesame seeds powder is very delicious! Great! Posted September 4th, 2014 at 4:07 pm | Log in to reply. I just made this recipe and it turned out amazing! This treat I was missing and now I can make it myself. Posted September 6th, 2014 at 3:18 pm | Log in to reply. Posted August 16th, 2014 at 8:52 am | Log in to reply. hello manchi. i have recently been watching your videos and i really want to make this injeolmi. i have failed more than 5 times. im using the normal rice flour it didnt work. and then few times i tried with japanese rice flour but it is not sweet so i use your measurements but added extra sugar. and i dont know why after mixing the ingredients its all so runny? and when i put in microwave it turn out cookd solid and stuck. :( help me !! 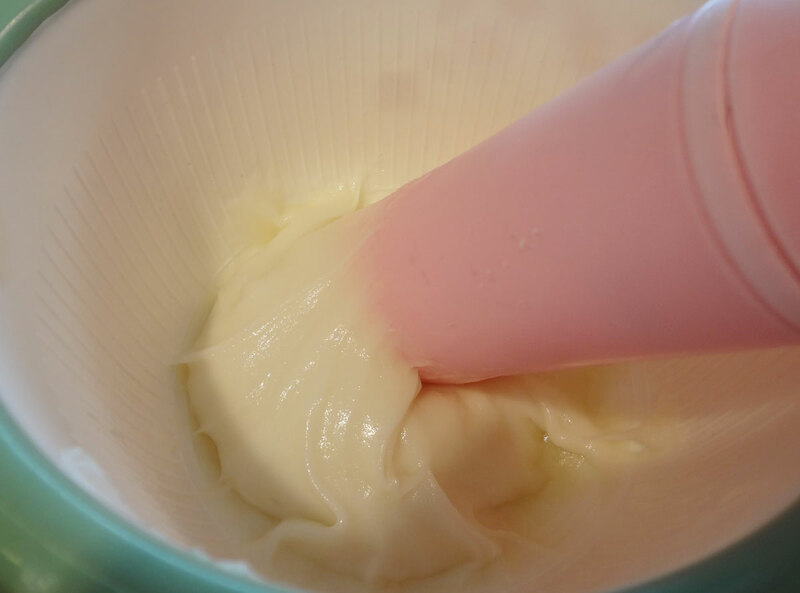 This recipe was originally posted on August 15, 2011 at 1:36 pm by Maangchi. It was last updated on October 5, 2014. The video was watched 506,991 times on YouTube & has 4,702 likes!